Reformed supervillain Gru (voice of Steve Carell) returns in DESPICABLE ME 3 (or DESPICABLE M3, if you want to go by the onscreen title). Also along for the ride are Gru's wife and fellow "Anti-Villain League" agent Lucy (voice of Kristen Wiig) and Gru's adopted daughters Margo (voice of Miranda Cosgrove), Edith (voice of Dana Gaier), and Agnes (voice of Nev Scharrel). And of course, Gru's diminutive yellow henchmen the Minions are back, once again playing a support role after headlining their own feature in 2015. When Gru and Lucy fail to capture 80s child star turned international criminal Balthazar Bratt (voice of Trey Parker), they get fired from their jobs at the AVL. The Minions also abandon their boss for refusing to return to a life of crime. 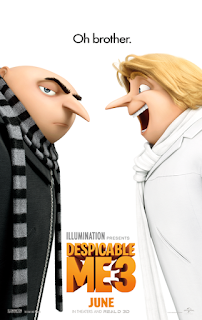 Things are looking pretty grim when Gru learns that he has a rich twin brother named Dru (also voiced by Carell). It turns out that Gru's father had been a famous supervillain, too, but he never had any faith in Dru following in the family business. Now that dad has passed on and left his secret hideout to Dru, he wants Gru to show him the ropes of villainy. But Gru has other ideas. Although he promises to teach Dru how to be a bad guy, his real goal is to capture Bratt and get his and Lucy's jobs back. Although based on some pretty familiar tropes (the long-lost relative, the fallen (anti)hero regaining his mojo), DESPICABLE ME 3 manages to turn this raw material into something that, if not exactly fresh, is at least entertaining. And because Gru has never been a full-on goody-goody, there's at least the hint of a possibility that he might choose to break bad again. It's that slightly subversive edge that, far more than the Minions, makes these movies enjoyable for this reviewer. That said, the novelty has worn off a bit, and while we haven't sunk to the level of "this should have gone straight to video" here, neither does this entry appeal as much as the first two go-arounds. But it works well enough that fans of the series should enjoy themselves, and newcomers should have no problem jumping on board, so what more do you really want, right? Pierre Coffin, who co-directed the first two films and the Minions spin-off, handles those duties once again. His previous partner Chris Renaud, however, is on hand only to voice the Minions and serve as an executive producer. Taking over for Renaud as co-director is Kyle Balda, who also worked with Coffin on MINIONS. As with the previous DESPICABLE films, the script is by Cinco Paul and Ken Daurio. It's obvious everyone involved knows and loves these characters. There's no doubt the primary reason for this movie to exist is to make money, but that love insures it never feels like a purely commercial enterprise. 3 out of 4 stars.